While these spam calls do not offer you actual solutions of value and should be ignored, Kimsey (or more specifically, her scammer-creator) makes one good point. Your google business listing is absolutely critical to your small local business. 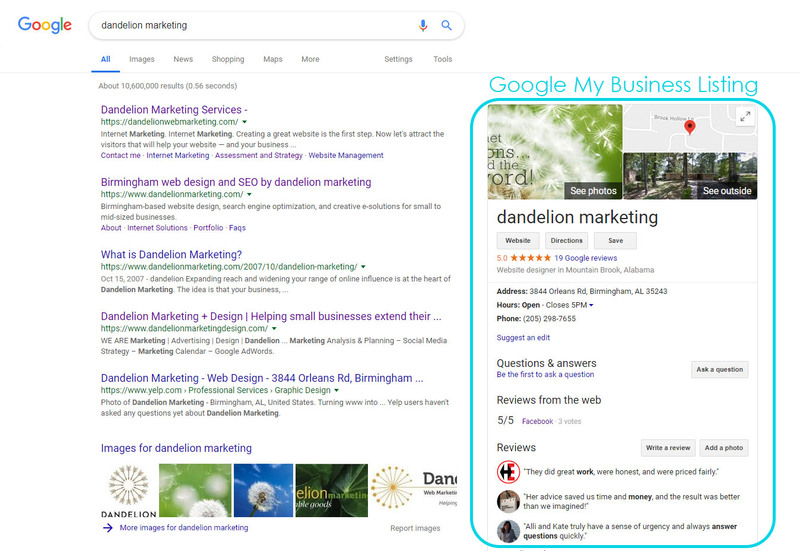 If you have not claimed and are not using your Google My Business (GMB) listing on a regular basis as a key piece of your business marketing, you are missing the best (and most affordable) tool out there. I hope I said that in strong enough terms; it is that important. You cannot afford to disregard Google My Business— it is free and easy and has a tremendous impact on how easily you are found online by potential customers. In fact, I would argue that if you did nothing else to market your small business in 2019, using my GMB should be your one-item marketing plan. When you finish reading this article, go to Google and search for your business name. What do you see? Here is a screenshot of the search results for “dandelion marketing.” Note the listing with the map off to the right. This is your GMB listing. If you do not see that listing, you will need to create one. If you do see it, but have never claimed it, claiming it is your first step. We will follow up in the coming weeks with specific ways to maximize this marketing opportunity. But for today, let’s start with making sure you have a claimed GMB listing under your control. If you need assistance or have follow up questions, that’s why we’re here. Give us a call at 205-298-7655.